After strong comeback numbers on Forbidden Planet and Skudge, Kimmo Rapatti aka Mono Junk decided to blow off the dust from Dum Records, his 1990s cult label that had been hibernating since 2007. 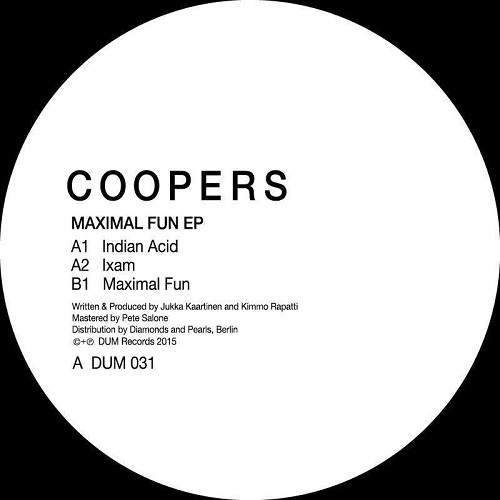 The Finnish imprint returns with “Maximal Fun EP” by Coopers, in its original 1994 composition of Rapatti himself and Jukka Kaartinen. Two seasoned gentlemen stick to vintage formulas and their singing acid sequences radiate real old school feel. “Indian Acid” and extra long “Maximal Fun” are bright and rolling tunes, perfectly composed for the warmth of Indian summer, while warehouse fans will find their satisfaction in the grinding acid stomper “Ixam”. The label’s next release under the catalogue number DUM 032 will be a reissue of Rapatti’s two classics, “Channel B” and “Monotone Fantastique” and after that we hope to see more of dazzling new productions on Dum.